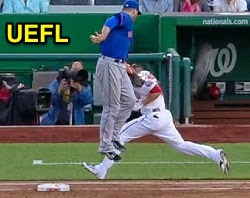 Instant Replay Review overturned 1B Umpire Ed Hickox's safe call in the bottom of the 2nd inning of the Mets-Nationals game. With none out and none on, Nationals batter Danny Espinosa hit a 1-0 changeup from Mets pitcher Jon Niese on the ground to shortstop Ruben Tejada, who threw to first baseman Lucas Duda as Espinosa arrived at first base. Upon Replay Review as the result of a challenge by Mets Manager Terry Collins, Hickox's ruling was reversed, the call was incorrect. At the time of the review, the Nationals were leading, 3-0. The Nationals ultimately won the contest, 5-2. This is Ed Hickox (15)'s third Replay Review of the 2014 MLB Regular Season. This is Crew Chief Dana DeMuth's 13th supervised Replay Review of the 2014 season. This is the 287th Instant Replay Review of the 2014 MLB Regular Season. This is Mets Manager Terry Collins' seventh Replay Review of 2014. Umpires are now 151/287 (.526 Affirmation Rate) in Replay Reviews during the 2014 MLB season.